Lists can be created by registered IMDb users. 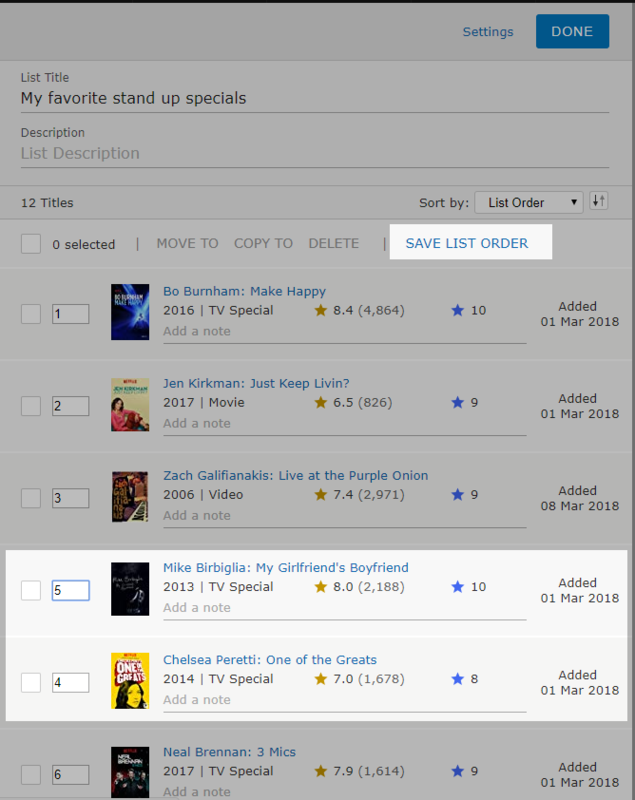 Lists are a fantastic way to share your movie, TV & celebrity picks with other IMDb users or just to keep for yourself. To create a list, please select your name in the right hand of the screen, select "Your Lists" from the drop down menu and click the "Create A New List" button. What can I add to my list? You can create a list including Titles, People, Images, or Videos on IMDb. To edit your list, select your name in the right hand of the screen, select "Your Lists" from the drop down menu, click the 3 vertical dots to the right of your list, and choose Edit. To remove an item from your list, check the box to the left of the item then click DELETE. How can I move list items without drag and drop? On the list you want to reorder, click the 3 vertical dots and select "Edit" from the menu. Once the page loads, replace the position numbers of the items in the desired order. For example, to move an item that is currently at #5 in the list order to #1, replace the number 5 with the number 1. Once you're done reordering your list, click "Save List Order" and the page will refresh with the new order. When you update the order position of multiple items in your list, the order of the remaining items will automatically shift up/down in rank accordingly. For example, if you have a list containing 10 items and want to move item #5 to the top of the list and item #3 to the bottom of the list, replace the number 5 with the number 1 and replace the number 3 with the number 10. As a result, item #5 will move to the 1st position in the list, the previous 1st title will move to 2nd position, 2nd title will move to 3rd position, 4th title will remain in 4th position, 6th title will move to 5th, 7th will move to 6th, 8th will move to 7th, 9th will move to 8th, 10th will move to 9th, and item #3 will move to the bottom of the list. Can I copy items from one list to another? You can! Select the three vertical dots to the right of the list you'd like to copy from, and select 'Edit'. On the edit page, click the box to the left of any items you want to copy, and when you're ready, select 'Copy To'. You'll then be able to select the list all the selected items will be copied to. What text formatting can I use in my list descriptions? 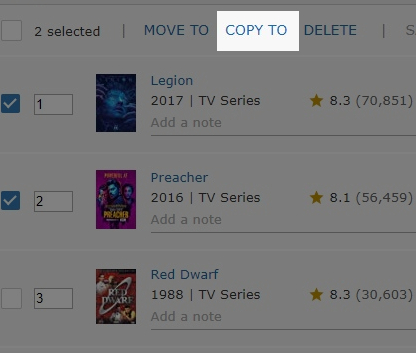 How can I add a TV episode to my list? 1. Navigate to the episode you want to add to your list. 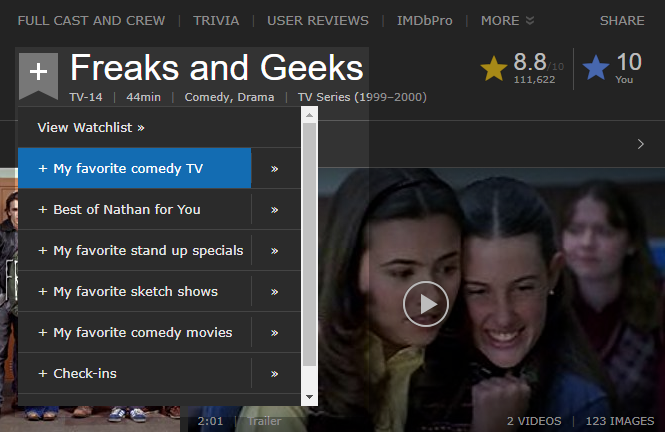 Hover over the Watchlist ribbon and select the list you would like to add the episode to. 2. On the "Edit" page for the list, enter the IMDb ID (example: tt4549946) for the episode into the field “Add a movie or TV show to this list” and click "Enter". To delete a list from your IMDb account, navigate to the Your Activity page. For the list you want to delete, click the 3 vertical dots and select "Delete" from the menu, then click “Delete this List” from the confirmation window. How can I update the privacy settings for my list? To change Your Lists privacy, select a list. Click the 3 vertical dots and select "Settings", select your preferred privacy setting, and click "Save". 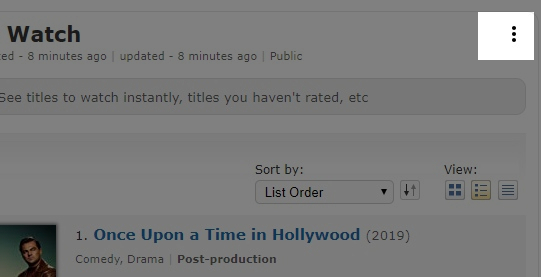 Toggling the setting to "Private" means that only you will be able to see your list; "Public" means that any IMDb user will be able to see your list. How can I share my list? Public lists can be shared via Twitter directly from our site. Navigate to the list and under "Tell Your Friends” in the right column, click the Twitter or Facebook icon. You'll need to log in to your social media account before you can share your list. You can also share your list by copying the URL from your browser and sending it to your friends via email. Can I comment or vote on a list? 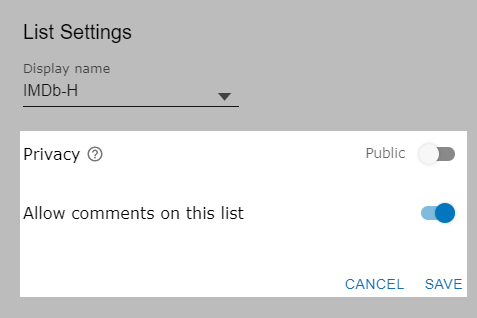 If the list author allows commenting on the list, you can add your comment at the bottom of the list. List authors also have the ability to disable comments, so you can occasionally find a list without the ability to comment. There isn't the ability vote on lists at this time. You can use the Facebook like button to provide the user with positive feedback. What does List Activity track? Where can I find my lists? To find Your Lists, please select your name in the right hand of the screen and select "Your Lists" from the drop down menu. Your Lists can also be found on "Your Activity" page. How can I search for lists? You can also find lists by navigating to a user's activity page. For example, you can see all the lists created by our founder Col Needham. How can I see if an item was recently added to a list? To see most recent titles added to a list, select "Date added" from the Sort By drop down. The sort by feature on lists will allow you sort any list based on the criteria you're looking for. What are the star ratings displayed below each title on a list? Is there a limited number of lists I can create? Yes, each IMDb user is limited to 999 lists. Is there a limit to the size of my list? Yes, Watchlists and Lists cannot extend beyond 10,000 titles. What happens to my lists if I delete my account? When you delete your account, we will keep your lists on the site, but will remove your name and User ID. How can I export or print my list? You can export your lists by first opening the desired list, and then selecting the 3 vertical dots to the right of your list's title. Then select 'Export' from the drop down menu. You can then easily print your exported list. How do I delete an item or invalid item from my IMDb list? To delete an item or invalid item from your list (i.e. “This item does not exist”), please navigate to the list and select the three vertical dots and select “Edit”. Select the item you want to remove and select “DELETE” and in the pop up window, select “Delete” to remove the item. Your list will refresh and the item will no longer be included in your list. How do I add a short film to my list? The IMDb List search doesn’t you to search for a short film by title name. To add a short film, please navigate to the title and click “+” and select the list from the drop down menu. Alternatively, if you have the title ID (i.e. tt0412936), you can enter the title ID in the search located at the bottom of your list to add the title. How do I add titles from the advanced title search to my list?